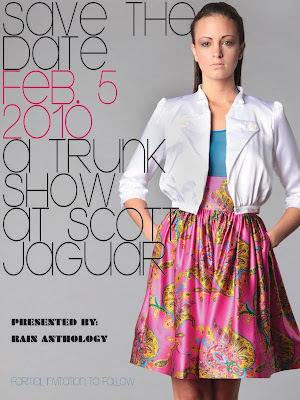 Designer Blaine Degannes will debut his Spring Collection during Rain Anthology's trunk show on February 5, 2010 at the Scott Jaguar Showroom. More details to come. To be placed on the guestlist, please rsvp to jameka@jswmediagroup.com.